what does one do with a chocolate version of one's wedding? i nearly ate it last night, but that didn't seem right. 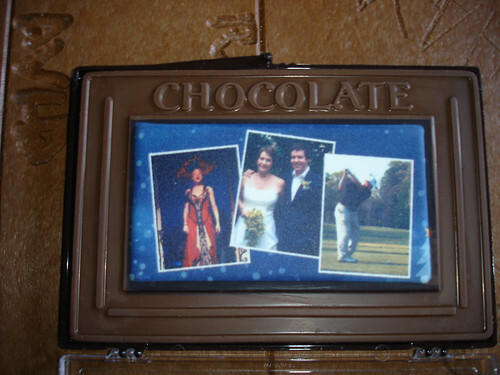 it occurs to me that in a chocolate version of the wedding, there would have been some teddy pendergrass on the ipod. yowza. i read the second comment first, which...made me panic for a second and zoom the photo. Wow. What are the other pictures? Is that Joe golfing and you, um, singing the blues at the Five Spot? while i'm sure joe has been snapped golfing, my brief but unsettling R&B career was, sadly, never documented (on food or otherwise). the pic on the left is caroline in hello, dolly!, and the one on the right is andrew winning a tournament. there was a general choco-triumphs theme, you see. How goes Andrew's golf career? Just curious, you know. pretty well...he's been racking up some player of the year awards. he also, to our great amusement, popped up on an nyc's best dressed list.